Hi - Allie McMurphy here. I love a good mystery series. I'm a fudge maker and I live on Mackinac Island, Michigan. The McMurphy Hotel and Fudge Shop has been in my family for over one hundred years. As a fudge maker, I have to get up very early to make the fudge before the tourist - we warmly call them fudgies- come onto the island for a day of turning back time. You see there are no combustion engines allowed on Mackinac. So we go by horse, carriage, bicycle or what my mom called "Shank's mare." That means by foot. Since I'm up early and run a hotel business, I don't have a lot of time to watch television. When I do get to watch, I'm streaming shows. Nothing I like to watch is ever on when I have a spare moment to watch. So my bichonpoo puppy Mal, and my calico cat, Mella and I snuggle up on the couch and stream our favorite mystery series. I like "Father Brown." Mal prefers "Murder She Wrote" and Mella, well, Mella likes "Death in Paradise." I happen to think Mackinac Island is Paradise, but I guess that's beside the point. My friend Jenn loves CSI, but I think it's because her boyfriend is a forensic scientist. Our next book releases Sept 25, 2018. There's a murder mystery pilot being shot on the island. Mal and Mella think it's great fun to get in front of the camera. I, on the other hand, would rather remain behind the fudge counter. Unfortunately that may not be the case this time. What's your favorite murder mystery television show and who do you like to watch it with? 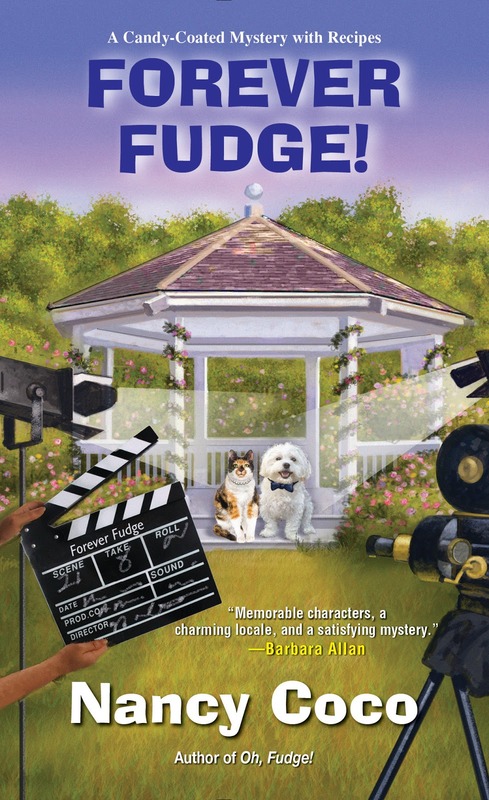 Leave a comment below for a chance to win a copy of "Forever Fudge." I use to love Castle when it was on. Mix of murder, mystery, and books! Thanks for the chance. Can't wait to read it. I love Murder She Wrote. I watch it by myself, but that's okay. Its just good fun. Oh my, there are so many good mystery shows! CSI, NCIS, Criminal Minds, Death in Paradise, Midsomer Murders, etc. My all time favorites are Hercule Poirot and Miss Marple! I do hope I can get to Mackinac Island someday. It's on my bucket list! I am looking forward to reading the new book! I like Midsomer Murders because I like the characters. Gotta be Criminal Minds. Love it! Murder, She Wrote and Columbo are my old favorites that I can watch anytime. Then there are Midsomer Murders and Murdoch Mysteries, love them too. I'm the only one so watch those alone. Together we watch Criminal Minds. Thanks for the giveaway. I like to,watch the Hallmark mystery movies. They have quite a few that come on and I like all of them. I just watch them myself. My favorite right now are Father Brown, Midsommer Murders and Dr Blake. I always watch reruns of Perry Mason and Murder She Wrote. Thanks for the chance. This comment was from me. I guess I wasn't signed in correctly. Thanks for the giveaway! I was enjoying Death In Paradise until they started changing the cast members. Then I lost interest. Pwrry Mason, my husband and I enjoy watching it together. Murder She Wrote is one of my favorite mystery series. Love this series, I can picture Mackinac Island and smell fudge when reading the books. I watch Murder She Wrote and Perry Mason with family. SILENT WITNESS is another favourite. I tend to watch it alone. Thankyou for thw chance to win!!! I loved watching Perry Mason with my grandmother when I was really young. Then there were movies of Agatha Christie books and Ellery Queen. Then the Hardy Boys and Nancy Drew. I dearly loved Murder, She Wrote and Matlock. I didn't really get into Columbo or other murder mystery shows during that time as I was more interested in reading!